NVIDIA Quadro GV100 and Quadro RTX pair powerful visualization support with the world’s most advanced GPU architectures for AI & Deep Learning. 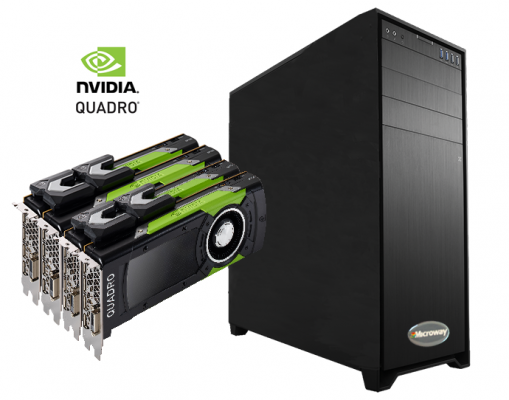 WhisperStation featuring Quadro GPUs provides the quietest, most powerful GPU computing workstation with up to 4 NVIDIA Quadro GV100 (Computation, AI) or Quadro RTX (Visualization & AI) GPUs. The high-fidelity visualization capabilities of the latest generation Quadro GPUs enable you create complex scenes, models, and renders with greater precision and in less time. Moreover, NVIDIA RTX technology enables the world’s first realtime ray tracing. Unparalleled design, simulation, and visualization technology is now available at your deskside! Use this AI prowess to inject artificial intelligence capability into your work. Whether it’s training based upon your existing renders to determine what to run, or simply adding a new Deep Learning project for your team, WhisperStation with Quadro GPUs will enable you to become an AI trailblazer in your organization. NVIDIA CUDA installed and configured – runs CUDA codes on first powerup! Telephone support is available for the lifetime of your workstation by Microway’s experienced technicians. After the initial warranty period, hardware warranties are offered on an annual basis. Out-of-warranty repairs are available on a time & materials basis. Each Microway system is customized to your requirements. Final pricing depends upon configuration and any applicable educational or government discounts. I just wanted to drop a quick note complementing your group on the Whisperstation. It is impressively quiet and performs beautifully. R immediately saw and could use all 16 cores and all of the RAM. I am definitely recommending Microway to colleagues.